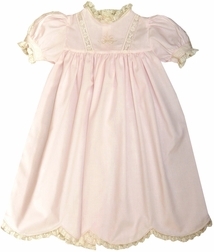 We just love our new heirloom dress for Easter, flower girls, portraits, holidays and other special occasions. We start with a flowing batiste short sleeve style and embellish the neck with French lace. The sleeves and hem are also adorned with the lace. The middle of the sleeves are made with a gorgeous feature: French lace inserts! The dress is completed with a pretty hand embroidered bow in the center.